"Slither" is an edgy blend of heart-stopping terror, wry humor and surprising humanity from genre-bending screenwriter James Gunn, whose "Dawn of the Dead" became one of 2004's most surprising hits. The sleepy town of Wheelsy could be any small town in America-somewhat quaint and gentle, peopled with friendly folks who mind their own business. But just beneath the surface charm, something unnamed and evil has arrived…and is growing. No one seems to notice as telephone poles become clogged with missing pet flyers, or when one of the town's richest citizens, Grant Grant (Michael Rooker), begins to act strangely. But when farmers' livestock turn up horribly mutilated and a young woman goes missing, Sheriff Bill Pardy (Nathan Fillion) and his team, aided by Grant's wife Starla (Elizabeth Banks), uncover the dark force laying siege to their town…and come face-to-face with an older-than-time organism intent on absorbing and devouring all life on Earth. "Slither" is the feature film directing debut of screenwriter James Gunn (the recent hit re-envisioning of "Dawn of the Dead") and stars Nathan Fillion, Elizabeth Banks, Gregg Henry and Michael Rooker. 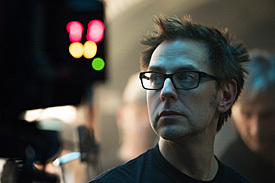 It is also written by Gunn. "Slither"-a Universal Pictures and Gold Circle Films presentation of a Strike Entertainment Production-is produced by Paul Brooks and Eric Newman.